“I had been buying a computer magazine since November 1992. And in the third issue I bought, I have read about Moonstone. That article I scanned for you. It is from the Czech computer magazine Excalibur, Issue 13, December 1992, (30,000 copies), 24 Czech crowns ($ 0,83) :-). Your luck is, that Excalibur had been being printed in colour since issue 11. 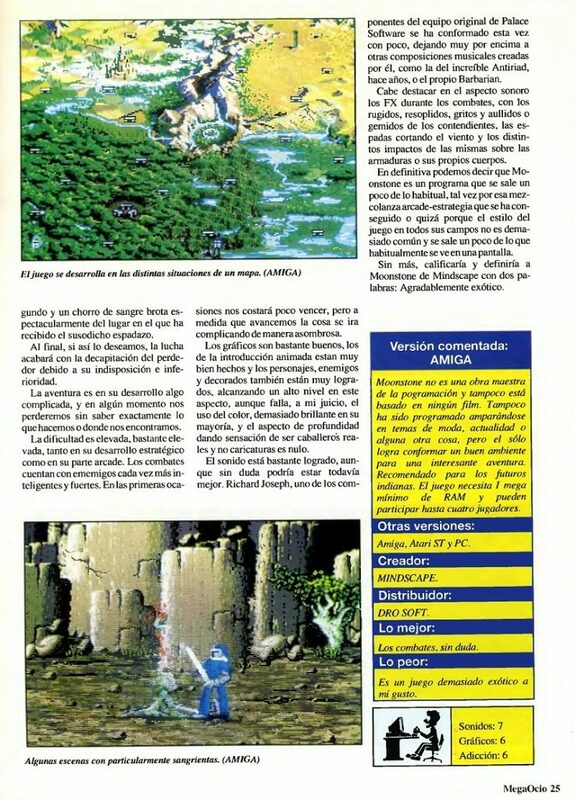 As far as I know, Excalibur was the first (and for a long time the only) magazine in Czech Republic, which was dedicated to computer games only. Today it is, as far as I know no more being released. The Czechs loved Moonstone – they gave it a whopping 85%! Amiga Joker (Feb 1992), ASM (March 1992), Power Play (Feb 1992) and Play Time (March 1992) all kindly submitted by Kultboy, webmaster of his excellent German Amiga reviews site. Well, the German gaming press obviously didn’t think too highly of poor old Moonstone, judging from these appalling review scores! Tavern contributor Tobias Protz has kindly written in with an explanation of the first three, while Sascha N chipped in with the fourth. Cheers both! The Amiga Joker reviewer obviously didn’t play the game long enough, his main point of criticism was that the controls were sloppy, therefore the outcome of a fight would depend more on luck than on skill. That, and the monotony of the game led to the low score. The ASM review wasn’t all that bad, they didn’t give the game a real score because they didn’t want to encourage minors looking for a “cool gory game”. Also note that the game was put on the “index” shortly after the reviews, that means that it may not be sold to people under 18 years in Germany, you may not advertise it or even show it openly in stores. The Power Play review scored so low because the reviewer obviously didn’t get the part with the main quest quite right and he also found it monotonous, not enough characters for a beat-em-up, too many breaks for a hack-and-slay and not enough to do and explore for an action-adventure. So he couldn’t make heads or tails out of it. MegaOcio, No. 35, 1992, kindly submitted by Maxi de Sokar. Micromania (date unknown), kindly submitted by Maxi de Sokar and translated by the fantastic Jorge Lobo! Thus, with Moonstone, this genre is ported into computing gaming. Flying heads, gushes of blood, exploding viscera…, they’re only a taste of the scenes you’ll be able to behold while you play in this mix of Videoadventure and arcade. Top Left Window: On occasion, to widen our purse, we’ll have to resort to many games of chance. Top Right Window: With this map, we’ll access to the different scenarios in which this game takes place. The game takes place in a fantasy land. The druids from the village have announced the arrival of the next season of the Moonstones. In this period, which only occurs every one thousand years, the warrior who completes the search of the sacred Moonstones will be granted the gift of maximum power. If you feel tempted by this interesting story, you’ll have to use all of your adventuring resources. After choosing one of the four available warriors, you’ll have to wander through a land in which centre lays the Valley of Gods, where all the sacred stones are placed. But to access to it, first you’ll need to find the four keys, which lay dispersed along the four territories. Thanks to a map, you’ll be able to travel with ease by moving you helmet, which represents your warrior, though this wide world. Violent and bloody fights with the three remaining warriors, with Trolls, Baloks, dragons, rat-men, mud-men and more, all terrible beings, will be your main activity. In addition to this, you’ll be able to visit mages, cities where you’ll acquire weapons in the market, or money by bets in dice games in the taverns. As important as your skill or strength levels, will be saving a good amount of money, which you’ll obtain by defeating other warriors. After defeating the different monsters you’ll face, you’ll obtain different kinds of help. Among them will be a set of various scrolls which will augment your fighting skills, healing potions and other advantages of great usefulness in this hard quest. Rob Anderson manages a program with a visual violence as high as it’s technical quality. After a presentation with great graphics and music, we get ourselves into an enthralling videoadventure in which movements, and graphics stand out proudly. The music and sound effects are also of great quality, as is the whole experience of this game. A.T.I. PC Gamer (suspected February 2006), kindly submitted by Kent Carlsson. Below is Kent’s handy translation. Cheers Ironclaw! Reader: Have you, o mighty game gurus, any tips for another game with the same style and feeling like “Moonstone: A Hard Days Knight”? Preferably newer than 1991. Thanks in advance, Conny Gyll. 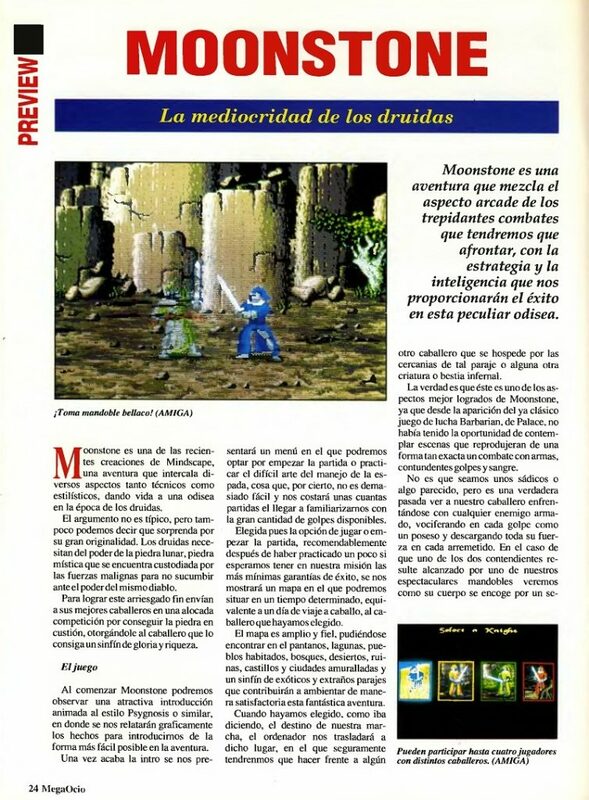 PCG: Moonstone is unique in the gaming history as long as we know. It’s such a shame, as we remember it with warmth. We still lie awake during the nights and hear the lightning from the intro, the song from the town’s tavern and that squirty sound when your knight’s blood pulsated out in tiny cute cascades. Our eyes are brought to tears by these pictures. The dragon, the keys, the swamp monsters…can it get any better? Dedicated to an old best mate of mine and Moonstone-playing compadre, Daniel Wright. Dan died in 2005, aged just 25. Rest in peace, Wrighty.